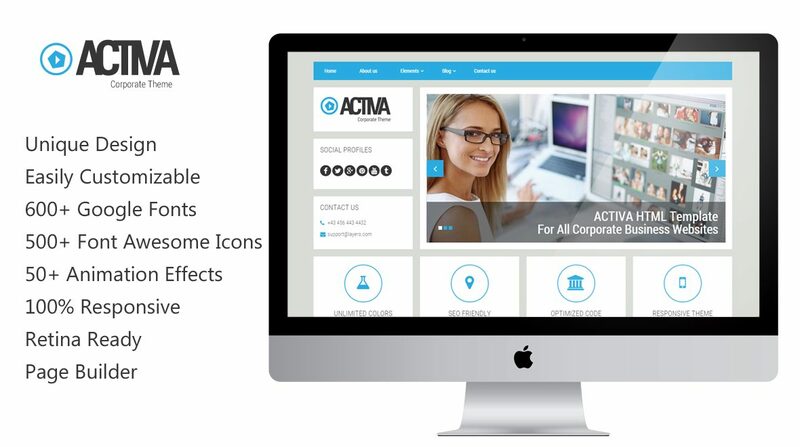 Activa is a clean, flat and fully responsive WordPress for corporates and business people. It is built with Bootstrap framework, is 100% responsive and contains retina ready Font-Awesome icons. Google fonts are used to make sure the text look crisp on all browsers and it gives you a variety of fonts to choose from. We also use animate.css so you can add awesome animation effects on the site. The theme comes with a page builder so you can easily build pages in any layouts allowing a lot of flexibility in design. A never seen before block style design which makes it different from other WordPress business themes. Activa business WordPress theme uses a page builder based on Unyson framework. You can easily customize pages with lots of design elements it provides. Choose from hundreds of Google fonts and easily customize your titles and body text. This WordPress business theme uses animate.css animations to provide awesome animation effects. Awesome experience on all devices. You can set up a shop on our WordPress business theme with Woocommerce plugin. The theme is translation ready thanks to Unyson’s ‘Translations’ extension. You can choose any color scheme for the website.